As processors get faster and companies throw more RAM into each and every phone, the differences between all of these devices become so much smaller. Nowhere is this more obvious than with performance, as the specs list of almost all flagships in 2017 reads very similar, and usually entails the Snapdragon 835 processor (which powers 8 devices on our list), with between 4GB and 8GB of RAM. In order to quantify these decreasing differences, we’ve turned to a series of industry-recognized benchmarks to help us determine which phone has the best performance. While some devices are known to cheat the benchmark system, the differences between devices powered by the same processing package are small enough to suggest that no synthetic performance enhancement has occurred in the background. This post is part of our Best of Android 2017 series. Learn about our testing methodology here. AnTuTu is arguably the best place to start for any benchmark rundown. This is partly due to its popularity, but it’s also a neat way of obtaining a single, simple measurement covering everything from the CPU to GPU rendering, storage speed, RAM bandwidth and much more. Like last year, OnePlus again reigns supreme with its second-ever T-series phone. We’ve still got plenty of tests to go, but the early signs are good for the 5T’s Snapdragon 835 / 8 GB RAM combo. Razer’s debut phone also makes a solid first impression in second place. The biggest upset here is the Galaxy Note 8’s placement below the Nokia 8 and the Kirin 970-powered Huawei Mate 10 Pro. All of the results were fairly impressive across the board, except for the BlackBerry KEYone, which is to be expected due to its mid-tier Snapdragon 625 SoC. Another well-known benchmarking tool, GeekBench 4 scores devices based on processing speed. The CPU results are split in two, with one number representing the performance of a single core and the other stemming from a full multi-core analysis (as if by magic, though, every phone on this list packs an octa-core chipset). The overall winner here is the OnePlus 5T which came first in the single-core tests and tied for second with the Razer Phone in the multi-core tests. The Mate 10 Pro slips to fourth in the single-core tests, but its Kirin 970 retains the top spot in the multi-core showdown. The Moto Z2 Force also impresses here, coming in above the average in both single and multi-core tests. The results make poor reading for Google, Samsung, and LG, however. All three elite phablets filled out some of the lower spots in both tests. The LG V30’s multi-core score of 5873 stands out the most as the only phone to come in below the 6,000 mark. Basemark OS II focuses on UX and web browsing, as well as system, memory, and graphics. There’s very little to separate the top three in the Basemark OS II tests, but Razer’s first-ever flagship takes gold with a score of 3610. The OnePlus 5T (3585) and Moto Z2 Force (3559) take silver and bronze. On the flipside, the KeyONE is the proud owner of the wooden spoon (you may notice a trend here). BlackBerry’s QWERTY keyboard-sporting device spared the LG V30 (2578) and Sony Xperia XZ1 (2877) a few blushes, though they ranked well below the next lowest entry, the Google Pixel XL 2 (3223). Aside from the KeyONE’s alarmingly low rating of 26, the rest of this year’s flagship crop all garnered respectable scores somewhere between the mid-50s to 60s. The Samsung Galaxy Note 8, Moto Z2 Force, and Razer Phone took podium spots, but none surpassed last year’s JetStream winner, the Huawei Mate 9. 3DMark is essentially the industry standard for cross-platform GPU benchmarking, with each test variant specifically tailored to measuring 3D graphics performance on either a smartphone, tablet, laptop, and desktop. Its creators are so confident in their testing system that they even call it “the gamer’s benchmark for Android”. The Slingshot Extreme test is specifically designed for flagship-grade Android (and iOS) devices. These stress tests use the OpenGL ES 3.1 graphics API and raise the rendering resolution 2560 × 1440 to test the full range of API features. The KeyONE did the worst by far, but if you’re looking to buy a BlackBerry for high-end gaming you’ve probably taken a wrong turn somewhere. The real talking point is the overall increase in test scores compared to 2016’s flagships. Six of the phones tested passed the 3,000 mark. The top three were the Samsung Galaxy Note 8, Nokia 8, and Moto Z2 Force, respectively. They all smashed the OnePlus 3T’s sub-3,000 winning score from just 12 months ago. This is even more impressive when you consider that all of the phones in the 3,000 club (with the exception of the Sony Xperia XZ1) have Quad HD displays which place a higher workload on the GPU than their Full HD counterparts. GFXBench is another high-end graphics benchmark that covers a variety of industry-standard APIs. We ran the high-intensity OpenGL ES 3.1-based Manhattan and T-Rex HD benchmarks for our tests to achieve frame rate scores for each device. These are onscreen results, rather than offscreen, which take into account each phone’s display size to ensure the fps measurements reflect real-world usage as much as possible. The Razer Phone won the T-Rex test with ease with a huge score of 78 fps. The Samsung Galaxy Note 8, OnePlus 5T, Huawei Mate 10 Pro, and Sony Xperia XZ1 all take joint second at 60 fps. Samsung’s flagship takes the top spot for the Manhattan tests with an incredibly high score of 54 fps. That’s a full 13 fps ahead of the Xperia XZ1 in second place, with Sony’s handset enjoying a significant boost thanks to its Full HD display. The Huawei Mate 10 Pro and OnePlus 5T also impress (38 fps), but the same can’t be said of the Razer Phone which plummets to 22 fps. After six different benchmarks and countless individual tests, this year’s winner pulled away from two very close rivals thanks to its consistency across the board. Put your hands together for 2017’s performance champion – the OnePlus 5T. On paper, OnePlus’ latest should’ve always been a top contender in this particular Best of Android category thanks to its industry-leading Snapdragon 835 / 8 GB RAM combo. In practice, the flagship killer lived up to that promise, coming first in the AnTuTu and GeekBench 4 single-core tests, and placing second in the Basemark and GFXBench (T-Rex) tests, as well as GeekBench’s multi-core tests. Second place was much tighter. Just one point separated the Razer Phone and the Samsung Galaxy Note 8. In the end, Razer’s plucky newcomer showed its mettle and pulled ahead of the industry veteran. Razer’s debut smartphone would’ve easily taken the top spot were it not for a woeful showing in the GFXBench Manhattan tests, where Samsung’s phablet absolutely flattened the competition. The Note 8 also topped the JetStream and 3DMark charts. Credit should also go to HMD Global for the Nokia 8’s performance. The Finnish company’s top-tier device came in fourth overall, garnering two second-place finishes—in 3DMark and GeekBench 4 single-core—and third-place in the AnTuTu tests. Huawei’s Kirin 970 processor also showed it can hold its own against Qualcomm’s ubiquitous Snapdragon 835, with the Mate 10 Pro coming joint fifth with the Moto Z2 Force, just one point behind the Nokia 8. The Sony Xperia XZ1 received a slight bump in the rankings because of its power-efficient Full HD display, but that doesn’t excuse the Google Pixel 2 XL and LG V30’s less-than-stellar results. Bringing up last place was the BlackBerry KeyONE which came last in every qualifying benchmark test. Of course, this only serves to show the huge difference that exists between the flagship Snapdragon 835 processor used by 8 of the other flagships, and the lesser mid-range Snapdragon 625 processor that powers the BlackBerry KEYone! 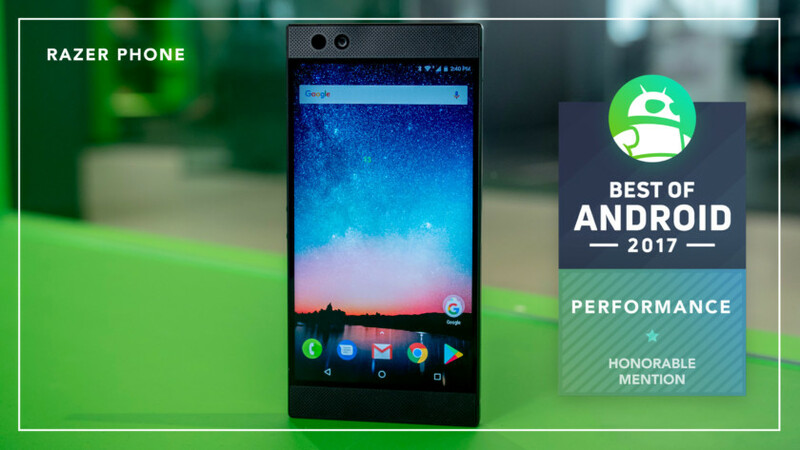 If you want to know which phone has the best display, camera, battery or audo as well, be sure to check out the other entries in the Best of Android 2017 series. Which phone do you think is Phone of the year? Vote in our poll below, as the winner will be crowned People’s Choice Smartphone Of The Year 2017! Remember, we’re giving away the three smartphones that come placed first, second and third in Best of Android! To enter, check out all the details below and for five extra entries, use this unique code: BOAP17. You can also get lots more entries by visiting all of the Best of Android 2017 posts and finding the unique code on each of those posts!